When I hear holiday crafts I immediately think … dollar store! 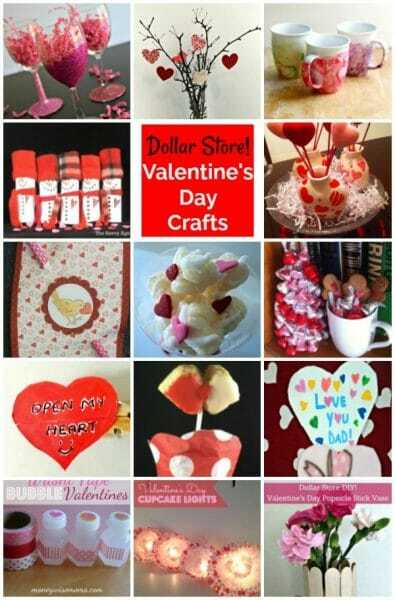 Valentine’s Day is no exception when preparing homemade Dollar Store Valentine’s Day gifts, treats and crafts. This is particularly true for those school classes which exchange small gifts or treats for Valentine’s Day and I need a gift, but a unique gift in quantity. Two of my favorite Dollar Store Valentine’s Day crafts this year are the Button Vase and Popsicle Stick Vase! 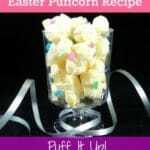 It is the Dollar Store to the rescue for fun Valentine’s Day ideas which are perfect to hand make in quantity yet still retain a little flexibility to make each gift in bulk with a personalized touch. Enjoy the following round-up of Valentine’s Day Ideas for crafts to make for gifts, class projects, teacher gifts or co-worker gifts. Special thanks to the creative contributors for their ideas and images so generously contributed! Shopping often and early are a few of the keys to successful Dollar Store Shopping. Through trial and experience I have developed a Dollar store shopping strategy to ensure I purchase as many materials as possible at the dollar stores in my area when the holidays approach. Day Four: DIY Valentine’s Day Button Vase – Dollar Store ! Affiliate links may be used in this post. Read the full disclosure policy here. Aren’t they! 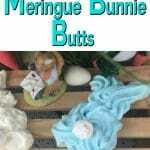 They are a treasure trove of fun affordable craft materials! Smile! 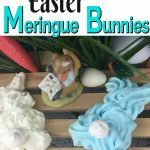 Easter Meringue Bunnie Butts !